Takes 30+ minutes after a game to be able to listen to a postgame show. Horrible. Was sad to see my favorite radio stations disappeared on another ap. Found it here and it works great. The app freezes all the time even on great WiFi. Also I’ve noticed that the commercials sometimes continue on a loop even through segments of radio shows and won’t go back to the show unless you restart the app. Not happy with the switch to Radio.com so far. It constantly stops playing, lags, drops. Never works smoothly. This app was forced on me when my radio station was only available here. It freezes all the time, won’t load, or I have to reset to sync with my car. Hope they fix the bugs soon. Right now this is app is terrible. I don’t know why some people are having so many problems with this App. I use it to watch my sports talk radio 105.7 and it sucked having to stop using the Tunein Radio App But this one works just as good. No buffering or Bugs so far. This was the only radio app where I’ve uninstalled and listened to something else rather than what I wanted. From that perspective, the current version a a major step up. It gets 3 starts only because it actually plays the one station for which I will use it. That’s an improvement over previous versions. All my national shows I can get somewhere else. It also is nice that it doesn’t plague me with pop-up ads like some other clients. The controls are primitive, there is not even support for screen rotation - something important for iPad users. The UI as a whole is focused on phone users, so this is not a surprise. It’s improved, but it’s still has a very long way to go to be considered a modern radio app. 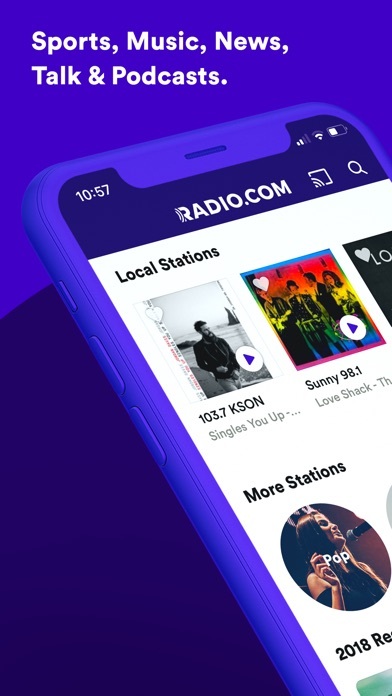 My main complaint is not with the app itself, but that Radio.com has gone the way of iHeart and RESTRICTED ACCESS to its radio stations to a specifically branded Radio.com app. Nothing against the app, per se, but I really prefer a more one-stop-shop for streaming radio stations. My preference is Tune In, which still has the most radio stations of any streaming app. I already have downloaded iHeart to get the one or two stations I listen to that they restricted from Tune In, now I have to download Radio.com to get the one or two stations that they have restricted from Tune In, as well. Maybe this makes sense to somebody, but it makes no sense to me. All I want is one app that has all the radio stations I listen to. What’s so hard about that? WWL Radio New Orleans should fix their streaming protocol as other stations work fine on this app. This app is unable to stream without continually STUTTERING. With a VPN it’s worse; way more silence than streaming. Also, no rewind or fast-forward option. One star rating is generous! I enjoyed using the TuneIn app for many years. But my station (670 The Score) switched to using exclusively this app. I miss the ability to pause and record segments (as not everything I listen to has a podcast, such as postgame talk). My number one complaint is that the app randomly plays even if I have stopped it. I have to manually close the app every time or it will start playing again. This is a easy great app!!! Good radio station choices and easy to navigate the app. I get what Entercom is doing putting their own stations on this app, but I would love for this app to have a rewind and pause button like TuneIn. Those are two easy fixes to the app that would greatly improve UX. All my favorite radio stations switched to radio.com and they are not available on my google home device, only echo devices. Not happy!!! Always available with no interruption. The best radio app I’ve experience! It works when you need it to an reception has been surprisingly strong! I listen to out of market radio show local hour until it goes national on ESPN radio and I have to say it’s the most uneventful part of my morning. This app constantly buffers and repeats the same commercials when you know the that show is back airing live. It also crashes a lot. In this day and time a app should be so lackluster with amount technology we have access to... I wouldn’t recommend this app to friends or family. Title says it all. Just a frustrating app. Crashed 4 times in 10 minutes. I hate this app. Love the variety of music choices. And the limited commercials is the best! Thank you! I don't sit around reviewing apps but this thing is so buggy and annoying that I had to. The content they use during commercial breaks is so repetitive and annoying. It constantly buffers and is clearly unsuitable for widespread usage. Whoever's in charge should be ashamed of themselves. I have been using this app for only a short time, and already the stream has dropped! I love the Radio.com app, but it’s hard to use since Internet is not reliable anywhere!! In my home I have the highest level of Internet available to purchase through Comcast and Sprint cell service but the app cuts in and out while listening to the Radio.com app and then is very hard to reload. So frustrating I just turn it off sometimes. Great App. Can hear all your favorite radio stations! Excellent for listening to radio stations over the internet. Clear single.. and don’t cut out!! I like this app and am glad that my smooth jazz station is on it. I just wish the google home mini would recognize it. Also, I wish that when one song is done and goes to the next, the listing advances to that next song automatically.....Other than that, it is a good app. I've had absolutely no problems with this app at all. Finally get to hear my fave country station when I'm not in the car! Poorly run app. Constantly crashes and 2/3 is the time the home page comes up blank and you have to keep closing/reopening app and hope it works... nice job guys! You’re either incompetent or just don’t care.. maybe both? This app is reliable and live streaming is great. I love that this app allows me to listen to my favorite stations! I work nights and use this app a lot and never any issues! I have been using it to hear the news radio stations everyday before I go to work, since I cannot hear it clearly on my clock radio. Connectivity decent. Every once in awhile the connection is lost. Don’t like that there is no feature that allows a pause of the broadcast along with an option to fast forward thru the broadcast when resuming play. Quick stream of the music I grew up with. Crystal clear oldies that are super hot. This app is terrible. That’s all you need to know. It keeps me informed in my home state. Love it. Great resource for listening to my favorite people’s station! Very many choices and live ND Football! It never works. They always play clips of other radio shows while I’m trying to live stream. Ever since my radio station dropped TuneIn I haven’t been able to listen. This app is worthless and I’m deleting it. Local feel no matter where your at. I listen to the ticket Miami all the way from Texas. Makes me feel like I’m on south beach! Love this App! Nice to have all the stations in one app. Get the radio station you want, when and where you want it! I love the fact that I can now listen to my am stations on the fm dial. Crystal clear quality. I enjoy the app. I like being able to listen to many varieties from around the US plus local stations. Great app to listen to your favorite radio stations. Has all my favorite stations! Excellent App! Excellent way to listen to local radio. The Radio.com app has many options for for listening to your favorite genre of music, news and entertainment. I listen on the TuneIn app and many of the stations have moved from that platform to Radio.com. If this is something you did, you understand that you will have to go back and forth because some of your TuneIn favorites did not move. Either way, Radio.com is good. Never a moment where I have a problem. I can listen to all my local stations when traveling. Frequently broadcasts a loop of commercials instead of actual station. Absolutely loathe this app. Love it, gives me the opportunity to keep up with my local sports talk station when Im at work. If you live in rural areas, this app give you better choices in music! 98.9 The Rock is awesome! The app works pretty good on the IPad, but Android Tablets have issues with it. Great options for your Radio listening. Quality superb! Best app ever really good selection of music!!!!! Can’t believe a feature available on every other streaming app is NOT on Radio.com. NO WAY TO PAUSE LIVE RADIO! What a sham. Why early in the am must one hear thirty minutes of commercials? Get tired of hearing about Jack’s Bowls and Flo’s wonderful insurance on a thirty minute loop. Doesn't have a pause or rewind feature. The back arrow goes to another station not a few minutes in rewind. Also starts having dropouts after listening for awhile. This app has potential. But if you are listening to it you will mostly be frustrated as even when you have a perfect LTE signal the app will cut on and off consistently. Very frustrating when you are listening to talk radio or listening to your favorite music. I was listening to a talk show on the radio in the car and then transitioned to the app when I got out - 10 minutes later and still only ads. Absolutely brutal app. No idea about user experience. Deleted it before I ever even got back to my show. So this is supposed to be an app that lets you listen to radio programs. Apparently using it for more than a minute wasn’t part of the design or using it with other Apps active is not considered. It seems to me the idea of radio is to be able to listen while multitasking. I suppose that concept doesn’t apply here. Once it stops, that’s it, you have to close the app and start all over again.... until it crashes again. Much buffering. Does not download the previous sport talk shows from the day. End Ended up deleting the app and trying again. That didn’t work so I downloaded the app for sports talk from iTunes. The old apps from each station were much more reliable. Hope they straighten it out. How horrible is this thing?! I have no other app problems, but I just downloaded and it’s crashed twice in minutes. This thing is a mess. I feel bad that one of my favorite stations WCCO in Minneapolis has moved to this app. Now the stream drops and never comes back. TuneIn was more stable and they should have never left. It’s not just them but the same thing has happened to Memphis stations I’d try to listen to like ESPN 92.9. There’s a lot this app needs to fix. My favorite station is getting rid of their personal app and having users switch to this. I have only got this app to work 1 time for me in the last month of trying daily. When I did get it to work it was so squashed and compressed sounding that I could hardly stand it. If it works I’ll use it but it doesn’t so back to the normal KISW app until you fix it. No excuse. I have unlimited sprint service on an iPhone 8 Plus. What a step back in quality and functionality being forced off of TuneIn to The Radio.com app. You cannot choose the sound quality on your own like you can on TuneIn. The default sound quality of this app just plain stinks. WXRT sounds terrible on its own companies app! You can’t make this stuff up! Had to switch from Tunein to Radio. This app is rather unstable, does not allow you to record and the worst part is you cannot pause the download stream. Not a fan of this app. I have enjoyed listening to a certain radio station that is now owned by Entercom for many years now. I have listened via the tunein app. It was not the greatest app out there, but it worked more often than not. Now that I have to listen to that station on the radio.com app it is frustrating. This app is horrible! It doesn’t hardly ever work correctly. It’s near impossible to set it up so I can enjoy my station while driving without having to mess with it. I am out in a position to where I have to decide if I’m going to pull over and try to fix it, or just listen to something different. I hate that I can’t just turn it on and leave it alone and enjoy my station. I think it is absolutely bad for business to force this garbage app on the people who enjoy(ed) listening to your stations. If you are going to force this on us, at least invest the resources to make it an enjoyable experience. I would never recommend this app in its current state to anybody. People often use this app to listen at work, where phone calls and visitors interior listening. Why on earth would you not have a pause or rewind function? Can’t believe that I can’t rewind live radio like I did with tune in!!! Steam is not bad but please put that feature in to rewind what I missed!! Frequently won’t open multiple times a day. It’s grayed out with no functionally. Eventually starts working. App constantly drops program for no reason at all. It just stops broadcasting the station. Is there a minus 1 star because giving 1 star is way too high. So many pop ups. Garbage app. I can't even read news from my favorite radio station because as soon as I click on the headline, 3-4 ads pop up. This app is frustrating and a waste of time. Listen to the Rise Guys in this app because it’s the only place you can find their podcasts. Only thing is, 8 tunes out of 10 I can see the podcast, the title and the length of time it is, but it won’t load. I click on the link to the podcast and it just sits there with a pause button showing. I miss the old app they used because this app never works more than half the time. Very frustrating. I’m even on WiFi with full strength of connection. Cannnot get waok 1480 talk. Very poor app. Very sad to lose TuneIn to this app. I was always happy to use the tuneIn app over this one. While the pause function on tunedin wasn’t always stable, the option was very cool. This app crashes often when you open and close it, seems better than before overall; maybe it will improve. You’ve got streaming issues and it’s extremely annoying. Never had issues like his with Tunein. I’ll listen to my local stations through my computer and delete this app. Please fix your Alexa skills!! The unfortunate decision of Entecom to force listeners to radio.com has resulted in a really bad user experience when listening on an echo device. Alexa can no longer start WFAN Sports Radio by simply saying “Play WFAN” which used to work just fine on Tune In. “Alexa, play WFAN Sports Radio” works intermittently (Alexa mostly doesn’t understand). So you are forced down a path of having to issue two commands “Alexa, open radio.com” and then when asked what station do you want to play, “WFAN”. Ridiculous. I hope Entercom Management, Sales and Digital organizations are getting this feedback because you are losing listeners as a result of this bad decision and poor implementation. Half the time, I don’t even try to wrestle my echo through this frustrating maze of commands and listen to a non-Entercom station instead. Doesn’t even support landscape view. All I get are commercials I don’t need to listen to this crap. 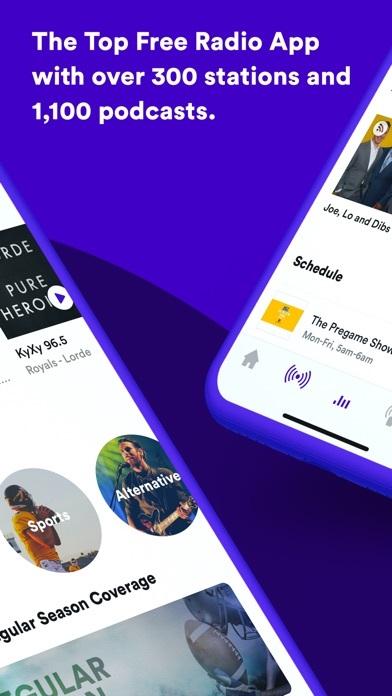 My favorite local news station moved from tunein to Radio.com. First time I used it I was not happy to find out I can’t pause the broadcast to pickup later. Very disappointed. The app works fine, but now that I’ve moved away from New Orleans I wanted a way to listen to the WWL play-by-play during Saints games. I guess it’s not licensed though. Boo. Really? This app can’t pause, play and skip? I understand no recording but this was a huge disappointment. WFAN please return to that other app!!!!! Instead of playing the next day or hours podcast is goes to the previous day or previous hour you have all ready listened to. It plays like a playlist that goes down in order instead of up to the next hour/ days podcast. Needs force touch to become modern app. At least half the time I can’t even connect. You guys may have actually done me a favor...I was listening to too much WEEI. Whoever thought of Radio.com at the station should be fired. Did I mention this is a horrible experience? My station 670 The Score was forced by their Entercom overlords to switch to radio.com app only. BIG MISTAKE. Can’t pause, can’t record, can’t go back 30 seconds if I miss something. Such a huge step down from Tunein. I continue to be disappointed again and again by Entercom.. tunein made live radio doable while on the move..this app is no better than buying a hand AM radio receiver. Way to take advantage of technology guys.. what a joke. I’d give it zero stars if I could. An abject joke of an app, the least functional app I have ever used. No pause, fast forward or rewind streaming radio. NO GOOD!!! Had to download this app because 97.1 the ticket in Detroit only streams here now. The TuneIn app was infinitely better because it allowed you to pause, rewind and then catch back up if you couldn’t listen for a few minutes here and there. Radio.com needs this or risks losing me as a listener to 97.1 the ticket. You need to add a pause (not just stop) and reverse and forward 15 or 30 seconds feature to this app. It is not at all user friendly without those features. Sometimes I need to pause the live stream. I don’t want to miss what was said just because you don’t have a pause feature. Edit: I’ve had this app for two days and it is complete garbage. I get choppy streams even when I’m on WiFi that I didn’t get at all with Tune In. This was a terrible choice by Entercom. This app is hot garbage. I was forced to move to radio.com from TuneIn to listen to my favorite station. I feel I stepped back 10 years. Gone is the ability to pause the stream or rewind. I listen in the car and in the office and it was nice to be able to pause so I didn’t miss my favorite broadcasts. So disappointed in an app that seems like it was developed 10 years ago and forgotten about. One of my favorite stations went from TuneIn to Radio.com. The stream drops all the time on the new app. Including while I am writing this. TuneIn was much better. They have now forced us to use their app to listen to the radio stations we want (WFAN for me), but this app is embarrassingly primitive. There is no ability to pause or go back if missed something. No ability to record. The podcasts are impossible to navigate. Get with the times! I understand you may want the traffic to go through your app for financial reasons but please give us an app that is up to 2018 standards! When I open the app and I try playing power 96, it does not play. Never got past the sign-in page. What a piece of junk! If you are going to remove your stations from tune in, at least have a better app ready. Stations all mixed up. Trying to listen to WFAN New York yet it’s playing CBS radio. Garbage. I had to switch to this app because the radio station I listen to dropped TuneIn (Entercom). Extremely disappointed with the lag and lack of pause and rewind functionality. I never expected this to be so bad. You can’t scroll forward or backward in a podcast. Sometimes the FF OR rewind in 15 second increments works. Mostly not. If you get a call or text in, the app quits and you must relaunch. I stopped listening to my favorite stations because app drops or won’t load 1 in 3 tries. Terrible terrible terrible. The “update” in July made things worse. The decision to remove XRT and other stations from TuneIn is a terrible decision. And to have a barely functioning app on top of that?! Shame on you. 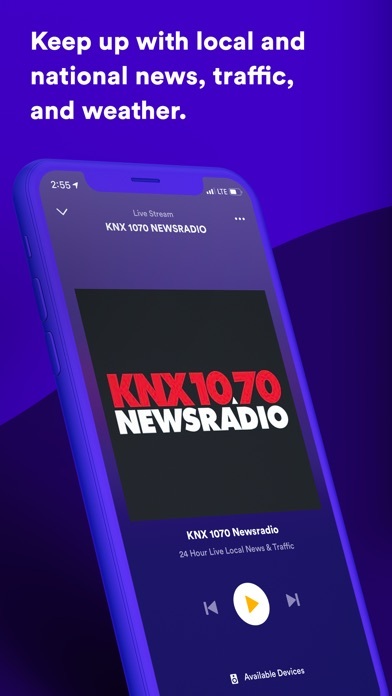 I have listened to KNX 1070 for years and miss the integration with the CBS Los Angeles local content. This app only gives you the station audio and no written or video content. Was forced to move to this APP when my old station was bought by entecom. APP is horrible to load and hangs constantly requiring multiple relaunch attempts. Then buffering is horrendous & doesn’t provide enough buffer to allow for short term coverage issues when traveling. Overall APP needs to be improved to make it operate smoother & provide for better notification of coverage issues. I’m glad I can listen to my favorite station, but the last app allowed me to rewind...a wonderful tool to let you listen to something you might have missed or wanted to let someone else hear. No pause button for the station I listen too. Can’t rewind or fast forward either. I’m disappointed my station moved to Radio.com. Constantly crashes. Lots of general audio issues. Has lots of trouble switching between WiFi and cellular. TuneIn is way better. Only reason I have to use this awful app now is because like all media in this country, it’s all owned by a few companies and they want their content on their platforms. The pause and rewind function on TuneIn made my listening experience completely in my control and now the big money oligarchy has taken that away from me. I never realized that I listened to so many Entercom radio stations. This is not a smart app, has too many bugs and is very unstable. Since Entercom dropped tune in, I can no longer get their stations on my google home devices. Sure in theory I can cast them from my phone, if I stand on one leg and wish, casting works 50-60% of the time. Some of the time its press and hold, sometimes it’s tap on which device you want to cast too. If you want to switch stations or not cast anymore. I suggest getting out of the app, closing it down all together and then try again, it can not handle change. So disappointing that a radio station is making me go back in time with technology.... right when I was about to get rid of my big shelf radio...or maybe it’s time to branch out to new radio stations... sad. You need to add a pause (not just stop) and reverse and forward 15 or 30 seconds feature to this app. It is not at all user friendly without those features. Sometimes I need to pause the live stream. I don’t want to miss what was said just because you don’t have a pause feature. Was forced to change to Radio.com App due to Entercom. They need to add a way to pause the show or go back in short increments. Also there should be a way to change the streaming quality. Definitely needs to be more user friendly. Maybe one of the worst and least intuitive apps I have ever used. Thank you for taking over my wgr 550 Buffalo sports radio and destroying my listening experience. Absolutely awful. Not to mention the app freezes constantly and/or just doesn’t work at all. Terrible. The radio station I listen to went to Radio.com and this app constantly has stability issues and you never hear a full conversation on talk radio. This has been an issue for them if you look at other reviews. It is extremely disheartening to see that this company doesn’t care about it’s users and still hasn’t fixed this issue. I love that I can take my favorite local radio station with me! When CBS radio stopped free streaming to switch to subscription only programming I started using this app. Have used it for a couple of weeks now and have nothing to complain about. I primarily listen to WIP out of Philly in the AM and have had no issues. It will periodically go silent for short periods, seconds, but not sure if it is them of the WiFi signal. So far it has been a good alternative to CBS who appear to be struggling financially and are gravitating to subscription for all their content, TV and radio. I love this app!! It allows me to listen to my hometown stations when I’m away from home. That. Way I don’t miss everything back home. I like listening to out of town stations while driving. Some of my favorite TuneIn stations I listen to through CarPlay are now on Radio.com. If some stations are permanently changing to Radio.com it would be great to have the Radio.com app work through CarPlay. Thanks. 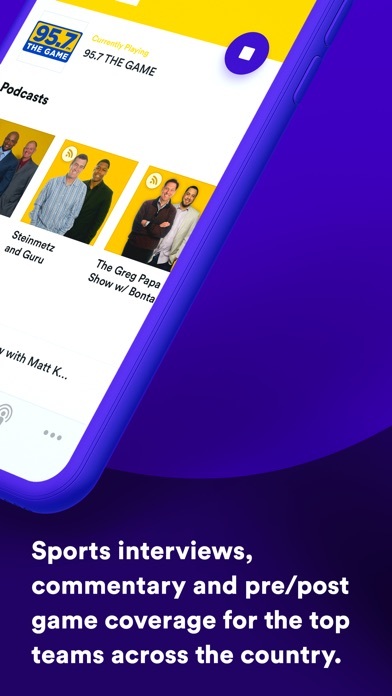 I was fully enjoying my radio stations through their own apps or through TuneIn Radio but both have switched to this app, and I can no longer rewind to listen to any segments I have missed, or wants to wait to hear until the segment is over to listen from the start. Navigating through this app is very user-UNfriendly, as it takes far too long to get to anything you want to access. I hate this app. Why can’t stations just leave well enough alone? In the few minutes that I’ve used this app and added stations, I’ve restarted it a half dozen times due to freezes. Perhaps things will be better once everything’s programmed and I’m just listening..,or perhaps I will just use the competitor’s app (rhymes with smart) or see what radio stations are still on TuneIn and weren’t forced to change. Few things I observed since some of my fav stations left tunein for this app. The general interface is poor. If you have a podcast section then you should have a podcast search option. There’s a few other things but I can’t think of them. The inability to listen via Alex is a huge mistake, period! Why break something that is not broken. If the developers aim is to frustrate people, so they no longer stream...success! I can’t give any stars, the last couple weeks I tried to use the app it ‘fails’. Whether on the WiFi or cell tower no connection. But if I google 94 wip I can listen fine. Never knew a radio app could be this bad. Keeps pausing for no reason. Getting stuck in ad loops. Just overall not a well built app. Forced to use this app to listen to WGR 550 from Buffalo as I live in FL. Repeatedly down, constant advertisements, terrible service. Dropping WGR for good and deleting this app now. This app can benefit with an increase of radio stations. This app can benefit with an increase of radio stations. Also, needs a night mode. For example, the background needs to be black. Way too many connection issues that I didn’t have when I could listen to my favorite stations on the TuneIn App. I really hate that the stations switched to Radio.com! The out of state station i listen to for sports constantly plays commercials during live segments. The app is trash until it is fixed. This is by far one of the worst apps I am forced to use if I want to listen to my hometown sports radio. On top of it being unreliable, buggy and unstable, it loops this incessant Great Moments in Sports nonsense. It went on for over 20 minutes the last time I was listening before I had to just stop. This app is absolutely and unequivocally awful. What a terrible product to force your radio stations to use. It only gets a star because zero or negative stars is not possible. Step one: tell all users that a new, BETTER app is on the way Step two: sunset all old apps and force the new downloads/users Step three: panic when you realize this app is not only worse, but just completely aimless. Does it play audio? Sure. Is it fast, easy to use or reliable? Not even by 2012 standards. Love being able to listen to my favorite stations on the go. However, it needs some work. Connection issues. The frequency of commercials is really frustrating. It plays the same 10 commercials over and over. (Sometimes at the same time every day too.) Not sure if it’s an app issue or a station issue. (I usually listen to 99.5 WYCD.) Drives me nuts! This app is terrible. Constantly cuts out for no reason. The only time it doesn’t cut out is when the show I am listening to goes to a commercial. Long live the 790 The Ticket app. Didn’t need this piece of junk. Was happy listening to my cbs news station on their app until forced to switch to this. Now glitchy can’t get it to work on CarPlay. Dropped cbs app in disgust when they forced me to this. Soon will drop this and thus listening to news 88. Only app I’ve ever written a review for. Local station was forced to migrate to this disaster. It glitches, freezes and crashes non-stop. The interface is horrible. Transferring between stations is a nightmare as the display says one station is playing while you are listening it to another. A working rewind and fast forward are both absent. Blow this thing up and start over. Until then, stop forcing stations to use it as only the consumer suffers. I only downloaded this app to listen to live 101.5 and it can’t even get through a song without constantly stopping to buffer. Really disappointed and uninstalling for I heart radio. Same commercials over and over. Not only is this app glitchy and full of bugs, I miss out on ENTIRE segments of radio programming on WGR550 because the app plays an endless looped montage of the "greatest moments in sports" (not to mention one of the 'greatest moments' is the tragic death of a player with heart problems, yikes). I miss my local radio app, which was discontinued after the station was bought out by the parent company. Endlessly frustrating and terribly designed. This app is a JOKE. Nothing but issues, kept cutting out even tho I had full signal, the ui is bad, don’t even know why we must download this app when the own radio station versions worked better. My local radio station deleted their app and this is the first app I’ve found as a replacement. Unfortunately this app has way too many bugs and is extremely unreliable for listening to live content because it constantly cuts out whether I’m on WiFi or LTE. That combined with the app not storing ANY content whatsoever so you can rewind any missed content makes it the worst app ever! As soon as I find a replacement this will be deleted! Not a fan of this new app. Wish they had a pro option. Tune In had a one time fee of $10 to buy the pro app where you could record your favorite shows and or pause them. This app has very basic features and is most unpleasant. This app is awful! Trying to listen to Acoustic Sunrise on Mix 104.1 Boston. The commercials get stuck in a loop and never stop!! I am hearing the same commercials 4-5 times in the same break. I have heard the same stupid Santa phone ad 25 times this morning. I am done with it. Ridiculous!! I used to listen to my shows on tunic in. I could pause, rewind, etc. Not with this app. It is awful. Get a call, missed something that was said, it’s gone forever. Ive stopped listening all together b/c of this horrible, sad excuse for an app. It 2019 for fek sake. Any positive reviews of this app are obviously Entercom employees probably forced to leave a good review. Like the listens were forced to eat this cr@p sandwich. I have been able to show what is and has played but for whatever reason, it is no longer showing currently. Have searched everywhere and nothing in the Help Center on this. Hmmmmph! I love being able to access great music all over the country but I want to know what I’m listening to. Please add song titles and artists so I can find them also allowing people to create exportable song lists would be great. Please work on an Apple Watch app. Thanks! Why did stations move from TuneIn to this?Is market research the only reason this app is up? NO KNAC, NO KLOS. The only reason I loaded this app is because KROQ moved from TuneIn. Somethins up. I hate this app. You could backup or record live radio on tunein. This app you can’t do anything like that. We have been FORCED to use this piece of garbage. I am rating this app until it comes to the Apple TV and the Apple Watch. If you can’t do both, then at least bring it to the Apple TV. *(1)* In today’s age of smart receivers, and songs containing code to identify Album, Artist, etc., it would be nice if my Bluetooth receiver showed the name and album of the song playing, instead of “Unknown Artist” and “No Album”. *(2)* It would probably also be nice if the receiver also showed the station call sign and frequency, like it does when I listen over regular radio. *(3)* it would be nice if the APP screen showed the current song playing on the station you’re listening to. *(4)* If the currently playing station has a graphic ad to highlight the stations call sign, it would be nice to see that, INSTEAD of the generic audio symbol on the station page. If the HOME PAGE in the app can show the individual station’s “Splash page”, the other pages should be able to display the same images. *(5)* I favorited a currently playing song using the app, went to another screen within the app as I was assessing features of the app, and when I went back to the “currently playing station” screen, the icon for favorited song was no longer checked, and had to press it again. Absolutely useless while traveling overseas unlike other apps I can use to listen to whatever station I want. I used to use Radio.com a lot. Now, it drains my battery in minutes whether Wifi or Cellular. So, delete it and reinstall only if i can use it with phone plugged in. Very disappointing app compared to what it used to be and i don’t recommend it. Laggy, no playlist just a schedule that is incorrect basically all the time! Try to listen on my Alexa but she gets used for other reasons!!! FIX PLEASE Thank You! I’m glad JD and now Jonny Ramirez are back on the air together. Love hearing their voices. It reminds me of the old Tejano days of the 90’s. Keep it going guys. You are both doing a great job!! Have to Give Personal Details to Listen? Was ok, but not getting better, got worse. I’ve used this app to listen to a radio station (WSSP in Milwaukee). The app worked great for a couple months, however, starting about 2 weeks ago something changed and the app is constantly buffering and the feed cuts out every 30 seconds or so. It’s not my phone or service, because all my other streaming apps work just fine. It is only this app and I’ve given up. I refuse to listen to anything on this now. I like this app a lot, but there’s one problem. It works fine for a couple of weeks, but then the Sleep Timer doesn’t work any more. I listen at bedtime, planning for it to be turned off. But sometimes it keeps on going and I have to delete and reload before it’s working properly. Hope you’ll fix it! The same commercials, 3 times each, in one commercial break? The app works fine, no issues. But the brutal replaying of the same commercials, 2-3 times each in one commercial break are a deal-breaker. Radio.com, you have to do better. One has no choice, if you want to listen to a specific station out of area, except listen to something else. Not even enough connectivity to click “send” on this review. (So this is the second time I’m typing it) Can’t get my radio station for more than ten minutes at best before connection is lost. Commute is over an hour and in that whole time I get ten mins of listening. Ridiculous. Also need live rewind as Tune In offers. I moved across the country and like to listen to my old stations. This app allows me to do that easily. Very inconsistent. I cannot access this station on mi iPhone, while on my iPod I can with no trouble. Radio.com is a must have app. I love radio, and since I spend so much time in my vehicle using Radio.com is a must have when I pull over to rest. It delivers nicely. I recently relocated to an area in Northwest Michigan where I found the local radio station playlists to be somewhat limited and repetitive —not to my liking. Radio.com allows me to access WXRT Chicago on my cellphone paired with a Bluetooth speaker. Not to mention the abundance of other radio stations that play music and have shows and features more to my liking. Not nearly enough station support compared to TuneIn... Also no watch app? C'mon get with it. For such a major platform for big stations this is a sub par effort. Love this phone app. I’ve tried a few different ones and this one meets my needs. Love listening to my hometown radio no matter where I’m at!! I listen daily to my favorite stations. I’m so frustrating with the frequency of this intermittent loss of signal. I contacted their support and applied their “fix” but it subsequently failed and continued to cut out. Contacted my internet provider and bought a new router/modem to no avail. This is the only way I can listen to my favorite radio station WXRT. PLEASE FIX! Why would this station make us ,,, switch to Radio.com....or better question why would you change and the Bills game isn’t streamed to listen to ...off radio.com. ???????? App works great. Listen to it every morning For my favorite morning show! I can listen to my favorite station from ANYWHERE!! Have been using this app for some time. Compared it to NextRadio. Prefer nextradio because of the info provided. This app can be better. I wish this app was compatible with the Apple Watch. 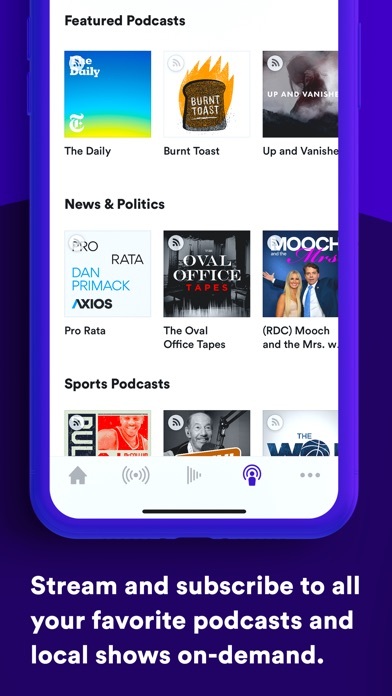 This isn’t a radio app, it’s an ad app with radio. Feel free to download if you want to become frustrated by its stupid existence. Bring it back, please ! Please bring back the now playing screen as well as the recently played/playlist option !! Enjoying the app. Would suggest removing the 30 minute default on the sleep timer. I would like to be able to set my own default time and not having to dial it in every night. I don’t like the new update! I don’t like the new look at all! The pictures are a lot smaller than before!👎 I wish I can downgrade it to the old version!👎 Just updated 12/05/18. Y’all need to fix a bug. It won’t show what song is playing for my stations I’m listening too!😭 I wanna know what song is playing! The local radio station from where I grew up switched to this app and is now the only way to listen to them. The drops and unexplained pauses in connection are not nearly as bad as the adds. The “do 1 thing” PSA plays 5-6 or more times in a row on one commercial brake. It’s infuriating and I can’t take it anymore!!! If there was any other way for me to listen to this local sports radio I would use it immediately. Please fix your app. This app is constantly crashing. Strange commercial interruptions in the middle of segments. Sometimes, the app will loop in some segment from months ago, always the same segment. Love the APP. Wish I could listen to NFL games via APP. I’ve used the Radio.com/Entercom app for a few months now, and haven’t had any issues. Everyday I listen to WBEN, WINS, KROQ, and a few other music stations from around the country. Keep up the solid app! All push notifications stopped working with new update. Installed, reinstalled several times. No change. I have downloaded your app and get notifications and when I open said notifications I get told to download the app. The only reason I want the app is for traffic alerts. So ridiculous and piss poor. I wish there was a zero star rating because that is what it deserves. Constant streaming errors! Crashes way too often, doesn’t like to play nice with any Ford or Genesis systems I’ve played it through. The station I listen to most changed over from TuneIn, which worked much better. Very good Clear, great selection of music! Nice way to keep up with my favorite local stations! So I this app is like a crap shot! Maybe u get the radio station u want or maybe it’s music trivia or maybe it’s one of the other stations u DONT want to listen too!!! No title of song or artist displaying . Some thing always goes wrong after new update frustrating. I started listening when I moved to Florida, so that I could still listen to my favorite morning show in Indianapolis (Smiley on WZPL). This is an awesome way to stay connected to family and friends still back in Indy. It helps me to not be so homesick. I also listen to a Classic Christmas station for the Christmas season. It plays all of my favorites from growing up to current. I listen to radio.com EVERY day, ALL day!! 100% Excellent Better then Tunein! This app is excellent much better then the Tunein better selection different states very reliable ! !I really enjoy this App ! Local station changed to Radio.com so I did as well. I’m quite frustrated. About 75% of the time the ads run in a loop after a news break & doesn’t return to the live broadcast. I’ve got the current update, restarted my iPod & still the same problem. Haven’t had any trouble with this app. I use it for only one station but it’s awesome. In my opinion it’s better than the iHeart radio app. I love the app, just hoping one day you will make it so we can rewind and fast forward like the tunin app other then that I’m a satisfied listener oh yeah and record also please and thank you! Had many radio apps, this is the best. Love this app! Let’s me listen to my my favorite radio stations long after leaving my car. This app is junk. Wgr550 keeps stopping. I contacted support and they did nothing. No more enter on stations for me. I tried uninstall then install no change. Also after it stops it will not start again. This app works as it should. Would love to listen to your stations on this device - what gives? Great except all those 5 top five song artist countdowns all the time & the cutting out / buffering it does frequently. Go back to Tunein. Please. It used to work so much better. I used to be able to not only hear the song being played but I could ALSO see the name of the song and the artist. Plus what was previously played several hours ago. Now when I check what’s playing I see Currently Playing then the name of the channel. Because of this app I’ve heard a lot of great songs that I’ve all but forgotten and now I can’t find out who’s singing them. Did something change? Could never get AM radio reception in my house. Now all is good. Got my WCBS station and it’s clear. Yay! I moved across the country and this is the avenue I always use to access my local sports radio from back home. It works fine for me. Do you enjoy 10 minutes of ads before hearing any content? This is the app for you! The station I’m listening to (95.7RnB) isn’t showing artist info like (name of song and artist) it normally does.....It’s been like this for a few months.....Will it be updated so people will know? Driving too Denver intl airport daily the stream stops so many times. The mtn app before worked much better. Why being a sell out!!! Can listen to my local sports station wherever I go. If I had to choose between the two, believe it or not, the web player. The web player, although not currently showing recently played songs, will still show the currently playing song on the bottom of your screen. It also delivers premium sound quality that this doesn't anymore. It also surprisingly works just as well as the app. The only downside is a 5-15 second video ad may pop up before your stream starts, and it doesn't happen every time. Same content, same performance, better sound quality, song information. I found Radio.com looking for WBBM.FM steaming on line. I was able to listen while on the website, but after downloading the app, Radio.com tells me that WBBM is not available. Yet, I was able to listen to it on their website, and they kept telling me to download the app for better connection. Nope... not available. Don’t waste your time. Anything you want will be “unavailable” live. The app keeps freezing - if my alarm goes off the radio. Stops and freezes. I’m sick of missing parts of my show just to reload this stupid App. Every time I use this app to listen to my favorite radio programs it cuts out! I get pieces of the broadcast. NOT reliable. A great app. An Apple Watch app would be better. This app is clearly not going through QC testing. This app is awful. I have listened to one station from my home town for years but I’m close to stopping because I have to use this app. It clearly is not broadcasting what is on terrestrial radio because they will force the same ads for 10 minutes or just not broadcast anything but commercials for at least that amount. For example I started the app at 8:32 this morning and have yet to hear the station content, and it’s commercials the whole time. It’s 8:47 now. I don’t want to do one thing to protect the environment or hear great sport moments repeated for 20 minutes. I understand the need for commercials but come on. More broken than tunein. Buggy drain of battery and wifi. App closes itself, app drains battery and bandwidth, app plays its own sponsored content at random times causing interruptions in stream. Garbage. Most radio apps have been garbage. Why is a reliable radio app that doesnt try to steal money so hard to figure out? It’s an app for commercials!